Game one in the pockets! We managed to come away with the victory thanks to a huge team effort and a clutch double by Candice in the Euroleague quarter final! The game began with a shootout between Yvonne and Johannes, the former scored five, while the latter six points (2nd minute 5-6). After that Candice and Godin exchanged baskets, to which Raincock-Ekunwe added a double. In the following minutes the shootout continued, but neither side was able to get in a significant lead (5th minute 11-14). 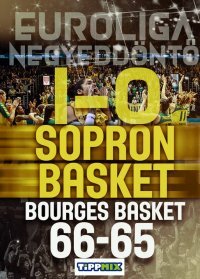 In the next couple of minutes we tried everything to come closer to Bourges, but were unable to do so, until Tina made two free throws to reduce the gap to a single point, and then after Queralt's made shot from behind the arc the advantage was finally ours – Bourges time-out (8th minute 20-18)! After that Rupert and Aleks both hit doubles, to which Sharp added a triple, but so did Queralt, setting the score for the first quarter (10th minute 25-23). Rupert got the second period going with a lay-up, to which Yvonne answered back with a triple (13th minute 28-25). This period looked the same as the first one, except here we had a slight advantage, and Bourges had to run after us (33-29). After that we came up with a 5-0 run to force Bourges's second time-out in the game (15th minute 38-29). Following the short pause Johannes converted two free throws into points, and then after a couple of unsuccessful offensive possessions Roberto Iniguez called a time-out (38-31). Then Raincock-Ekunwe ran down the court for a lay-up, to which Chartereau added a three-point play. What's more, Plouffe even managed to tie the game up again, but then Candice put an end to the French's 7-0 run with a double. When Plouffe hit a double again, Roberto Iniguez called his team to the bench to talk things over with 15 seconds remaining on the clock. After the break we had the opportunity to take the lead, but couldn't make the shot – tie game at half-time (20th minute 40-40). The third quarter began with a shootout between Johannes and Candice, in a little more than two minutes these two have scored eleven points (23rd minute 44-47). Three minutes later the scored hasn't changed a bit, because of the excellent defensive effort the two sides were putting up. A little bit later Roberto Iniguez thought he had seen enough and called his team to the bench for a time-out (26th minute 44-47). When the teams came back on court Queralt broke the scoring drought with a mid-range double, to which Johannes answered back likewise. Then Tina made two shots from the free throw line, followed by a lay-up by Plouffe at the other end. After that Yvonne made two shots from free throws, regaining the lead, to which she also added a lay-up just before the sound of the buzzer (30th minute 54-51). Yvonne's shot came off the rim at the beginning of the final quarter, but then Tina put it back for two. At the other end Plouffe beat the buzzer for a double (32nd minute 56-53). A little while later Queralt increased our lead with a double, but then Plouffe made a lay-up at the other end as well. Olivier Lafargue thought he needed to talk to his team afterwards – time-out Bourges (35th minute 58-55). After the break Candice made a mid-range double from the side, to which Johannes answered back with a free throw. Then Raincock-Ekunwe made one of two from the line, to which Ouvina added a double to tie the game up, forcing our next time-out (38th minute 60-60). After the short pause Bourges took the lead, when Raincock-Ekunwe made one of two from the line, to which Yvonne answered back with a double. 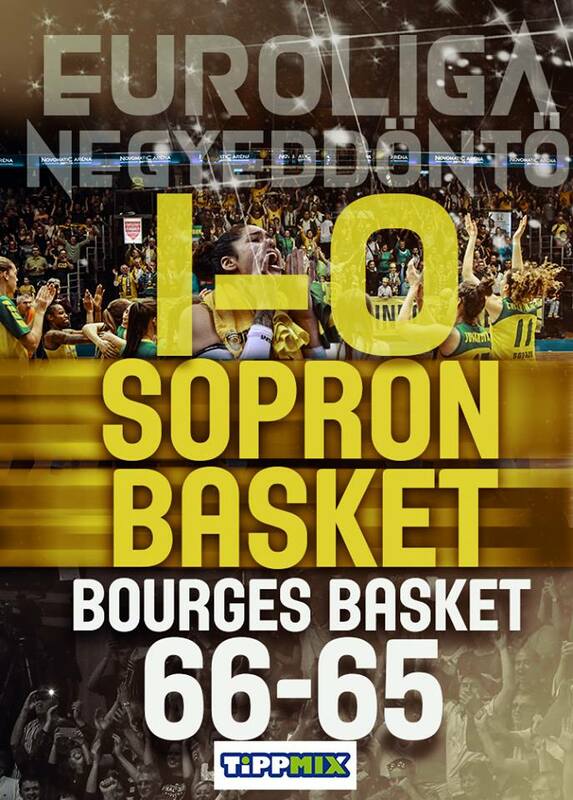 Then it was Bourges's point guard who scored again, but so did Yvonne from the line, forcing a French time-out with 33 second on the game clock (64-63)! After the break Aleks collected her fifth personal foul and had to leave the court. Then she watched Raincock-Ekunwe make both of her attempts from free throws, giving Bourges a one point lead, and forcing our last time-out in the game (64-65). From our next possession Candice hit a huge double off a spin move, 4.3 seconds on the clock, time-out Bourges (66-65)! The French tried one last shot at the buzzer, but missed it, we won the first leg of the Euroleague quarter finals (40th minute 66-65)! Roberto Iniguez: It was a tough game, but that's what we expected! Bourges is a great team with fantastic dynamics,big knowledge and physique, and they are also well-prepared tactically. I think we can play better than we did today. Everyone in the locker room know that this was only one win, we have to keep going and learn from our first quarter.We have to focus on things that got us here better. On some players I have seen signs of fatigue, but I hope we can recover until Friday. We have to play in one of the arenas with the best atmosphere in Europe, and try to close the series. It will be very difficult, but not impossible with a winning mentality! Candice Dupree: It was a tough game, OUr defense could have benn better in the first half but it wasn't what we will need on Friday in the second half either. Olivier Lafargue: We wanted to play good basketball against a Sopron team with incredible fans. We have worked for games with an atmosphere like his all year! Now we will go home and I hope that we will return for a game three. Elodie Godin:We knew how important today's game was in the series. Not counting the first quarter we have defended well and played a very good game with Sopron.